There are countless stories in every drop of seawater. But with a cast of millions and more plotlines than a daytime soap opera, the stories can be a bit difficult to follow. The stories, of course, depend on which particular drop you’re watching and what time you tune in, but in the sunlit waters of our ocean’s surface, about a million microscopic organisms are living their lives in every single drop. They take in what they need to live, spit out what they don’t, reproduce, and die. They may get eaten, starve to death, or become infected by viruses and explode all over the place. Some battle each other for resources, while others work together and depend on each other. Drops of seawater may be lacking in romance and gunfights, but they house a wealth of ongoing dramatic tales of microscopic life and survival. A drop is quite small, and microorganisms are even smaller. Their invisible complex micro-stories might seem inconsequential. So why would anyone bother watching them? Three-quarters of our planet is covered with a layer of seawater that is more than two miles deep on average. That volume adds up to somewhere around a trillion trillion drops (or a septillion, if you prefer) and about 100,000 times as many microbes. This hard-to-fathom abundance means that the lives of these small organisms have large-scale consequences for our planet. They play vital roles that help determine the productivity of marine fisheries and the amount of the greenhouse gas carbon dioxide in our atmosphere. But how does one see what’s happening on a microscopic level in the ocean? Watching stories in drops of seawater isn’t as straightforward as turning on your television. You could stare at a beaker full of seawater all day, but you wouldn’t learn much (except maybe that you really need to find a hobby). Watching microbial seawater stories requires both biological and chemical techniques, first to simplify the stories and ultimately begin to reveal them. Who’s making and eating what? Using genes as a way to identify them, scientists are now illuminating a cast of characters that was completely unknown to us a few decades ago. While work in this area continues to expand, it is the “what are they doing?” part of the story that we still know relatively little about. 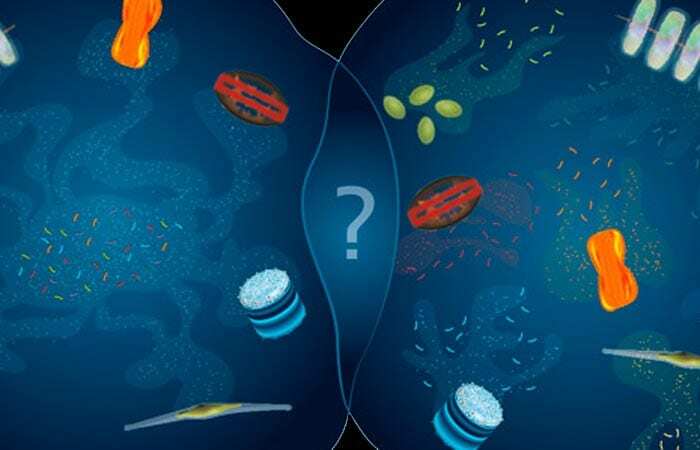 Simple questions regarding how various marine microbes make a living remain mysteries, and these gaps in our knowledge are like missing pages or scenes that collectively make it difficult for us to follow the story. One fundamental mystery involves questions about the food and waste that these microorganisms produce and consume. Though tiny, many ocean microbes are quite active. Collectively, they are like communities of microscopic farms and factories that are capable of consuming and producing a vast amount of material. Scientists refer to the carbon-based material produced by living organisms more simply as organic carbon. It turns out there is about the same amount of carbon in the form of carbon dioxide in our atmosphere as there is dissolved in the ocean in the form of organic carbon. But what exactly is this dissolved organic carbon and where does it all come from? If you had to choose, a good place to start the story would be with the autotrophs. Autotrophs are organisms that can create their own food, and many of them do it using photosynthesis. They use energy from sunlight to turn carbon dioxide into organic carbon. Then they use the organic carbon compounds they make to grow and reproduce. The plant on your windowsill is an autotroph, and so are many of the microorganisms that live in the sunlit portion of the ocean. 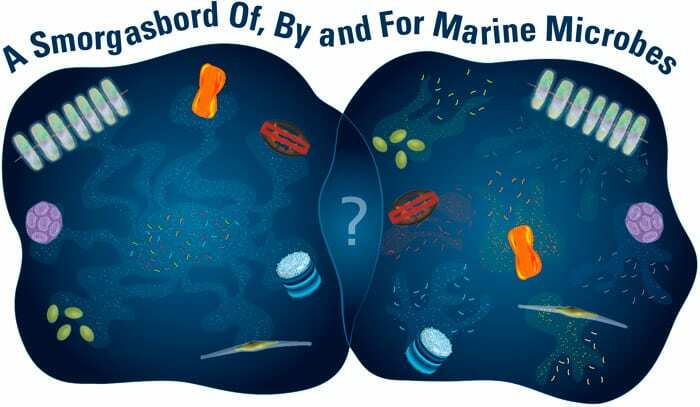 These microbes form the base of the marine food web by producing the organic carbon that ultimately feeds almost all other living marine creatures. If you can’t create your own food like an autotroph, then you are a heterotroph. Humans are heterotrophs—carnivores, vegetarians, and vegans alike. To survive, you either eat something an autotroph made (carrots, corn, apple) or you eat something that used to eat autotrophs (a hamburger was once chomping on grass all day long). Many seawater microbes are also heterotrophs. Just like us, they need organic carbon to live, but they can’t make organic carbon compounds out of carbon dioxide themselves. They have to get it, either directly or indirectly, from autotrophic microbes. So how does a heterotrophic microbe, with no teeth or micro-cutlery handy, eat another microbe when they are about the same size? The answer is: They don’t. While some larger marine microbes do actually engulf or swallow other microbes whole, most heterotrophic microbes in the ocean do not actually consume other organisms. Instead, they take advantage of the fact that every drop of seawater is teeming with dissolved organic carbon compounds. How do these compounds get there? They were all produced by autotrophs but are no longer part of any living organism for a variety of reasons. Larger organisms that eat microbes do not always swallow them whole, and like a baby in a high chair, leave bits of microbes all over the place. Autotrophs infected by marine viruses can burst open and expel all their organic carbon into the water. Autotrophs are also known to simply exude organic carbon compounds from their cells into the water. It’s not clear why this happens. It could be that they make extra compounds and ditch them when they don’t need them. They may panic under stressful conditions and release material. Some may just be a bit leaky. Whatever the cause, much of the organic carbon produced by marine autotrophs ends up as nonliving material, and this becomes the No. 1 food for heterotrophic microbes. But this relatively straightforward story starts to get fuzzy when you dig a little deeper. What exactly are all these organic carbon compounds? Which autotrophs make which compounds? Do different heterotrophs consume different compounds? Why does a certain portion of dissolved organic carbon seem to sit around in the ocean while other portions disappear almost immediately? If a drop of seawater gets warmer, or less salty, or more acidic, do the compounds change? Are they produced more slowly or consumed faster? We don’t really know the answers. Not knowing not only limits our fundamental understanding of the ocean, it also compromises our ability to predict how future global changes may impact the lives of marine microbes and, in turn, the health of our planet. One way to get answers to the questions above is to focus on individual characters in the drop of seawater. We’re starting to be able to do that. Advances in culturing have allowed us to keep many marine microbes alive in the laboratory, grow them in large batches, and study them individually, in a setting that is simpler than the ocean. That allows us to examine dissolved organic carbon from a known biological source that has not been consumed or altered in any way by heterotrophic activity. New instruments make it possible to acquire chemical information about these compounds, so we can begin to compare the organic carbon produced by different autotrophic microbes. That’s the premise of my research. After I grow a batch of a particular autotroph, I filter out the cells and am left with the organic carbon they produced and released. In a process called liquid chromatography, I pump the liquid containing this organic carbon through a tube filled with material that binds the organic carbon. Based on their chemical properties, compounds move through the material at different rates. The process separates the organic carbon so that compounds emerge from the tube at different times. The compounds then enter an instrument known as a mass spectrometer, which organizes molecules based on a ratio of their mass and charge and counts their abundance. Through a combination of computational and statistical analyses, we are uncovering the chemical compounds that various autotrophs release from their cells to the ocean, and we are beginning to make connections between the identity of the producer and the material it produces. The next question is to figure out if particular heterotrophs prefer to consume particular compounds. To do that, I have been collaborating with Dr. Michael Rappé at the Hawai’i Institute of Marine Biology. We feed different organic carbon compounds obtained from these autotrophic cultures to cultures of different marine heterotrophic bacteria, then measure changes in the heterotrophs’ growth rates. In this way, we can begin to identify which organic compounds made by which autotrophs are preferred by which heterotrophs. My experiments have shown that the story is indeed quite complicated. Some heterotrophs do not seem to respond to any of the compounds tested so far; others will grow much faster and reach a higher concentration when given compounds from certain autotrophs, but not others. I’ve found, for example, that several subgroups of the highly abundant heterotrophic bacteria known as SAR11 seem to enjoy snacking on organic carbon produced by the autotroph Prochlorococcus, but they appear to be unaffected by organic carbon from any other source we’ve tested. Studies like these have the potential to reveal previously unknown links between specific autotrophs and heterotrophs, forged by the chemical compounds they produce and consume. By closely examining the stew of organic carbon compounds dissolved in the ocean, we are beginning to learn who makes and eats what compounds and how those processes combine to make the natural world go around. It will also teach us how these links and scenarios may change as conditions in the ocean change, and how that could affect the nature and health of our planet. If, for example, conditions were to change and favor autotrophs other than Prochlorococcus, SAR11 bacteria may suffer as well, which could lead to further shifts. And that’s just one plotline. There is still a lot more work to do before we get the full story. This research was funded by a grant from the Gordon and Betty Moore Foundation and by the National Science Foundation Science and Technology Center for Microbial Oceanography: Research and Education (C-MORE). MIT/WHOI Joint Program student Jamie Becker sets up incubation experiments aboard the research vessel Melville during a research cruise to the South Pacific in the fall of 2010. Becker served as junior chief scientist on the BiG RAPA cruise, which was part of the C-MORE program (Center for Microbial Oceanography: Research and Education). 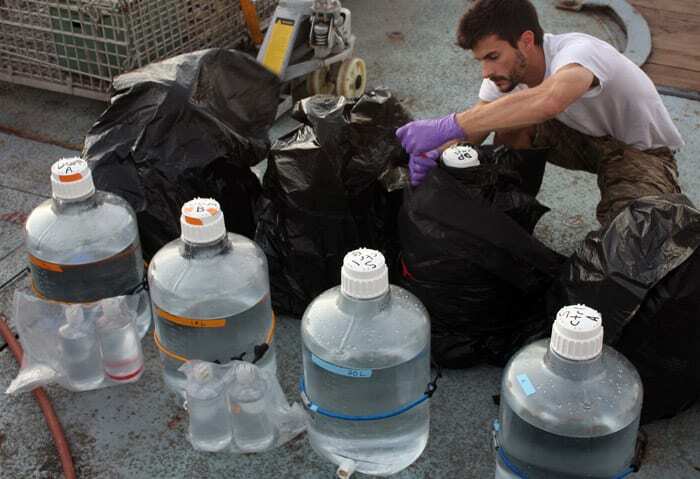 During the cruise, researchers studied microbes along sharp biogeochemical gradients from the coast of Chile to Easter Island. The incubation experiments were designed to reveal how natural microbial communities respond to dissolved organic carbon from different sources. Flasks contain samples to be injected into a liquid chromatograph-mass spectrometer to reveal the dissolved organic carbon in them. 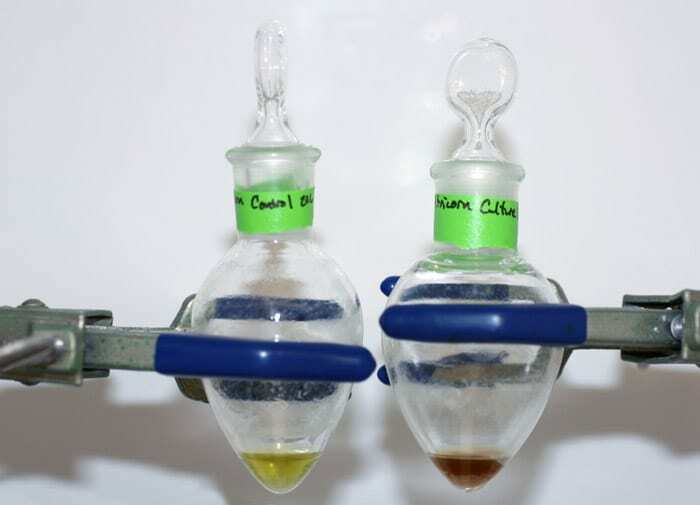 The brown fluid in the flask on the right contains organic carbon compounds produced and released by a specific autotroph. (The left flask is a control for the experiment, containing a seawater-based incubation medium with no autotrophs added.) Some dissolved organic carbon compounds, like the brown pigments here, can be seen with the naked eye, but most are colorless and can’t be seen without the help of instruments such as a mass spectrometer.